I dig figs. As a kid, I enjoyed snacking on Fig Newtons, which had a nice combination of crunchy filling and smooth cake. Or were the outer crusts actually cookies? It was always hard to tell. About one year ago, while at my friend’s parents’ house, I sampled a fresh fig just picked from their fig tree. At first I was a little apprehensive because I did not know how to eat it. However they showed me how to break off the stem, peel the fruit and eat the center. 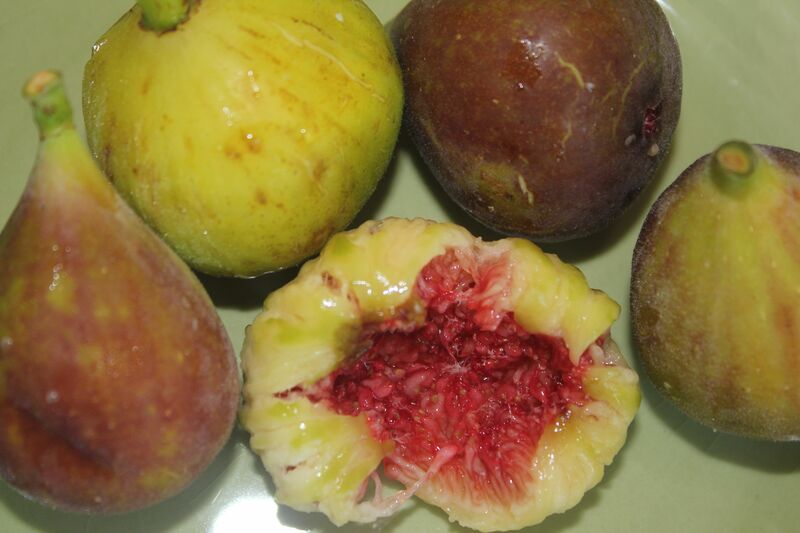 The fruit was so good – sweet, juicy and fragrant. 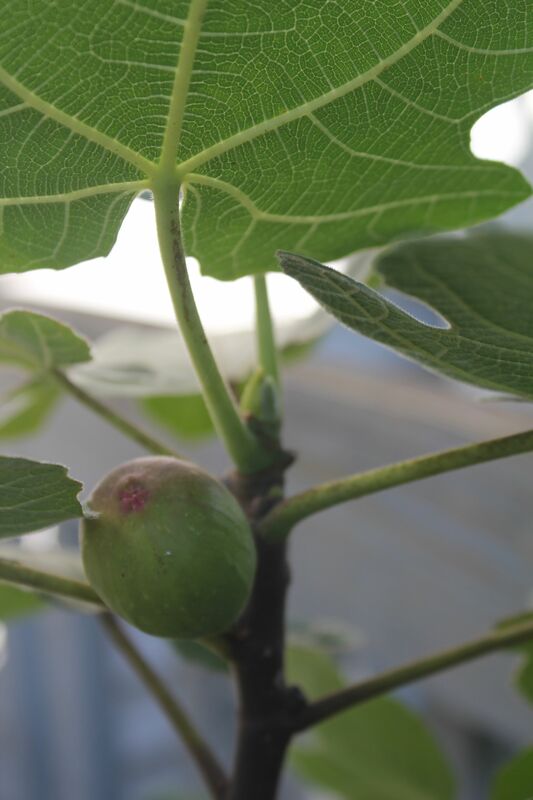 So I tried another and another…and when I went home that evening, I had a bundle of figs under my arm to enjoy over the next few days. Not only are figs delicious, but they are nutritious too! According to Nutrition-and-you.com, figs are low in calories and high in soluble fiber. They are also good sources of vitamins A, E, and K; and minerals such as calcium and iron. So what’s not to love about this fabulous fruit? This past summer, whenever I saw fresh figs on sale at the grocery store, I purchased them. The figs usually come six to a package and I would eat them two at a time. I never dreamed that I would ever have enough figs in my possession to use them in a recipe – since I just enjoy eating them as is. 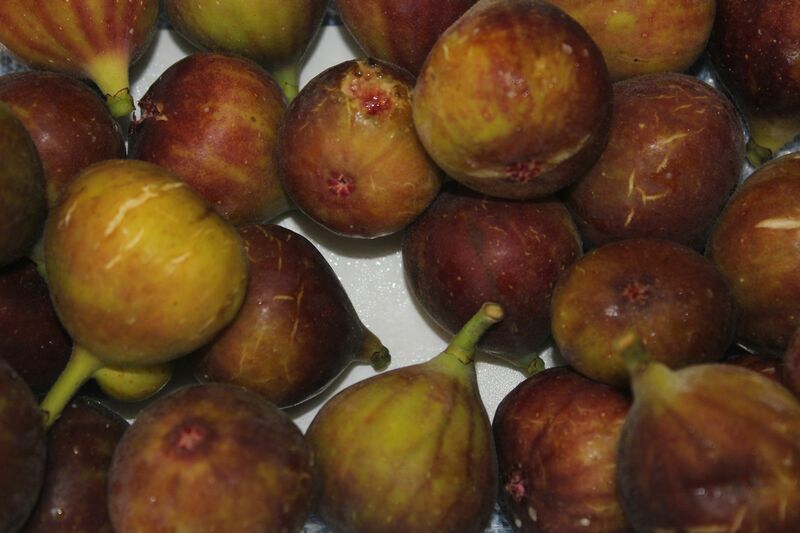 Well last week, I had a lovely visit with my friend’s parents…and they gave me about 80 figs to take home! For the past few days SensitiveHusband and I have been enjoying an ongoing fig feast! And guess what other wonderfulness was bestowed on me? They gave me a small fig tree, grown from a piece of their own. It is now adorning my deck and has a few figs ripening on it. We will bring it in for the winter and intend to plant it in the springtime. I hope to experiment with fig recipes in the years to come. That is, if I don’t eat them all as I pick them! 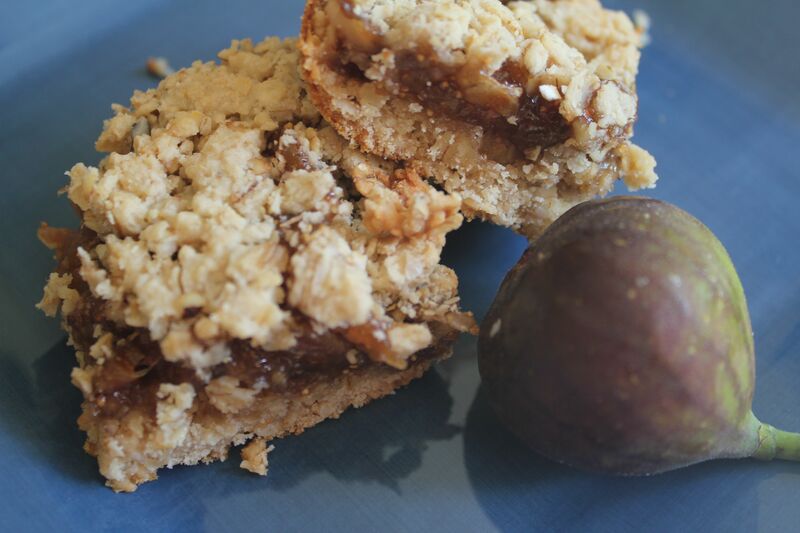 Below is my first ever fresh fig recipe…the result is a fabulous dessert bar mixed with oats and walnuts. I started with a recipe from Simple Daily Recipes that used fresh figs (rather than dried) as the main ingredient. I substituted the cane sugar with honey and reduced the overall amount of sweetener used. I also played with the amount of water in the filling and added some chopped walnuts to the top for an extra flavor boost and crunch. These bars are so delicious; thanks to Tony and Sylvia for their hospitality and for sharing their figs and tree with me! For Filling: Combine figs, water, honey, salt and lemon peel in saucepan and simmer 1 hour or until dark and thickened, stirring occasionally. Combine flour and water and stir into fig mixture. Cook 5 minutes longer, stirring constantly. Remove from heat and stir in lemon juice and walnuts. For Crust: Mix butter with honey until light and fluffy. Combine flour, salt, and oats into creamed mixture. Divide mixture in half and place half into the bottom of a well-greased 9 x 13 inch pan. Spread the fig filling evenly over bottom layer. Sprinkle remaining half of crust mixture on top, along with the remaining walnuts, and press with fork. Bake for 30 minutes or until lightly browned around the edges. Cut into squares while still warm. Cool completely before removing from pan. I am sharing this recipe with Simply Sugar and Gluten Free. This entry was posted in Recipes - Dessert and tagged Cane sugar free, dessert, fig, Honey, Walnuts, Yeast free. Bookmark the permalink. Mil and Fil (mother-in-law, etc.) 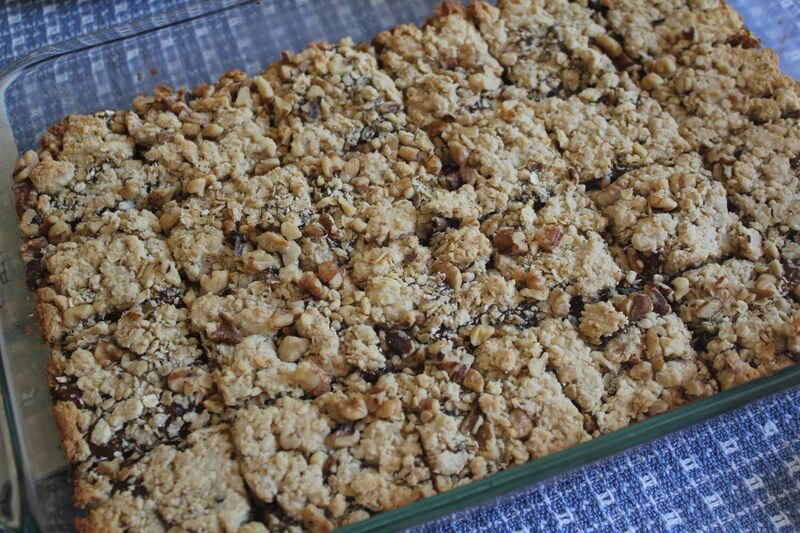 were the grateful recipients of two fig bars yesterday, and let me say, ‘fig cookies’ move over! These fig bars are delicious, so nutritious and no refined sugar! I’m picturing them baked in a loaf pan, sliced like bread and on the Thanks”giving” table with a couple of fresh figs in the center of the dish. Herewith, I am sending those wishes into the Universe. Um, um, um, um good! Thanks, Dil, for so many creative and delicious recipes. Thanks, MIL! I am so glad that you enjoyed the bars! They would be perfect at a Thanksgiving meal.